Product prices and availability are accurate as of 2019-04-19 03:58:30 UTC and are subject to change. Any price and availability information displayed on http://www.amazon.com/ at the time of purchase will apply to the purchase of this product. Self Styled In 60 Seconds Choose from the selections of beautiful, trendy and popular styles. Close to 100 styles available and more to come ... -Blends with your own hair for fullness without bulk. Change styles as often as you like in just a minute -Better than a wig. Blends with your own hair quickly -Better than a weave. Can be done anywhere, anytime by you, without help -Lets you be you. Use quick weave to allow your hair to recover from braiding, weaving, stocking caps and wigs. Instructions 1. Part the hair from ear to ear and comb forward. Insert front comb 2. Push cap down and insert back comb 3. 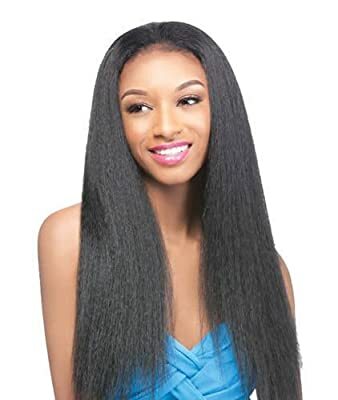 Comb hair over part and blend hair to desired look Half Wig By Outre Quick Weave Outre Quick Weave half wig Annie is a long length half wig that has a natural yaki texture that blends well with your own hair. Try this long (about 22 inches) and full style to create a voluminous and natural look. Also with heat safe synthetic fiber and 8 different color options, your new half wig will look more natural and unique to its style.